“Veterans of what?” was a phrase Tami Thacker, the Veteran Services Coordinator at the Veterans Resource Center (VRC), would often hear from young people on campus when mentioning U.S. Military veteran students. Additionally, veteran students were seen as disgruntled during their fight for a space on campus that could successfully accommodate their 100 student population. The center was successfully moved from the small one-couch room of Costo Hall to the much larger Bannockburn H-108. Transitioning from military to civilian life is a challenge for veterans. For those that go to college, one of the challenges they face is the age gap between them and the majority of the student population. Fredy Dominguez, a third-year transfer mechanical engineering major, is one of the veteran students who felt like an outsider because of the age difference between him and the student population. “I’m always hesitant (to meet new people). I think that feeling like an outsider kind of prohibits you from going and trying to find all the resources and getting involved right away,” he stated. The VRC had given Dominguez a way to connect with other veterans. Thacker, a veteran herself, had also gone through similar experiences. “We’re trying to blend back in,” she commented. Back when she was an undergraduate, Thacker would get anxious during class from observing the other students not showing respect to the professor, an authority figure. “It’s tough because you’re used to being in an environment where you are quiet, told what to do and listen. Here it’s not the same,” she explained. “Veterans have a different mindset than the civilian student,” began Jennifer Sayre, a third-year history major. Sayre was 20 years old and working at Home Depot when she enlisted in the military. After finishing her service six years later, Sayre’s discipline and time management skills aided her when she began college. Attending college has helped Sayre transition into civilian life by providing her with a routine. 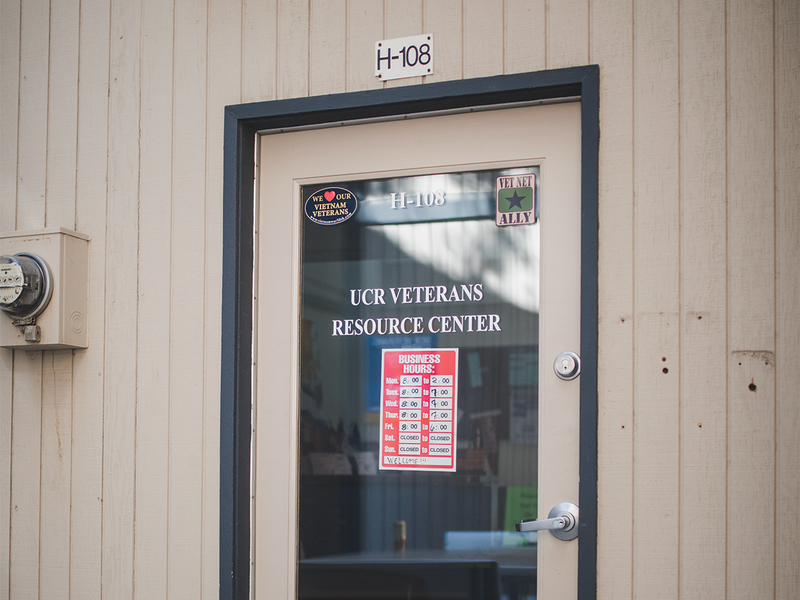 With 218 veterans attending UCR just this fall alone, the VRC saw a 22 percent increase in attendance from the past year. Sayre, who is now a student assistant at the VRC, hopes to mentor and calm the fears of incoming veteran students, a task that she deems important not just for the veterans but for herself as well. “When I was in the military, my career meant something. I felt like I was doing something for the community, and it’s important in my mind to continue to do that,” Sayre said. Sayre’s original aspiration was to become a veterinarian. However that changed after hearing a history professor at her last community college speak about his experience in law school. The professor dropped out of law school after realizing that he would not have enough time to spend with his family and became a professor. Since then, Sayre reflected on the long and hard work she would encounter as a veterinarian. This prompted her to switch to history, a subject she enjoys, and plans to go into education to become a college professor. The VRC offers veteran students benefits and information regarding financial aid, classes and counselors. In order to use their benefits, veterans need to create an education plan and are aided by an advisor. In addition, the VRC offers veterans a financial advisor to help them process their paperwork. The Veteran’s Resource Center will be holding an open house on Tuesday, Nov. 6 from 2 p.m. to 4 p.m.